Dansyl chloride (Dans-Cl, l-dimethylamino-naphthalene-5-sulfonyl chloride) was used by Weber in 1952 for the first time for the preparation of fluorescent conjugates of albumin. It has subsequently found almost as wide an application as Fischer’s naphthalene sulfonyl-chloride or Sanger’s 2,4-dinitroflurobenzene (reviews, see Gray, 1967a; Seiler, 1970; Seiler and Wiechmann, 1970). Its usefulness is due to the fact that its reaction products with amino acids, amines, peptides, proteins, phenols, imidazoles, and sulphydryl groups have an intense yellow to yellow-orange fluorescence and can be separated easily with suitable chromatographic systems (Seiler, 1970). Woods and Wang (1967) first described the fractionation of dansylated amino acids on polyamide sheets (review see Wang and Weinstein, 1972), and Gray and Hartley (1969) introduced this method of separation for the determination of end-groups and in sequence analysis of proteins and peptides. 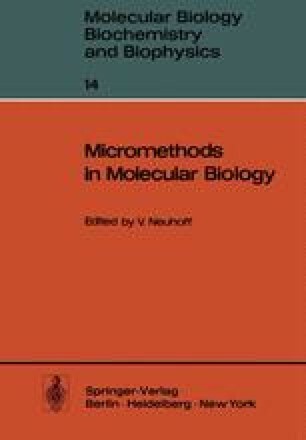 It was Hartley who, during an EMBO summer- school in Elmau in 1969, suggested adapting this technique to the micro-scale. This was immediately successful, the normal 15 × 15 cm polyamide sheets were simply replaced by 3 × 3 cm ones, and the application of the dansylated sample was performed with a very fine capillary under the stereomicroscope. On a 15 × 15 cm polyamide layer about 10-9 moles of each dansylated amino acid is detectable; using 3 × 3 cm polyamide layers as little as 10-12 moles can be detected.